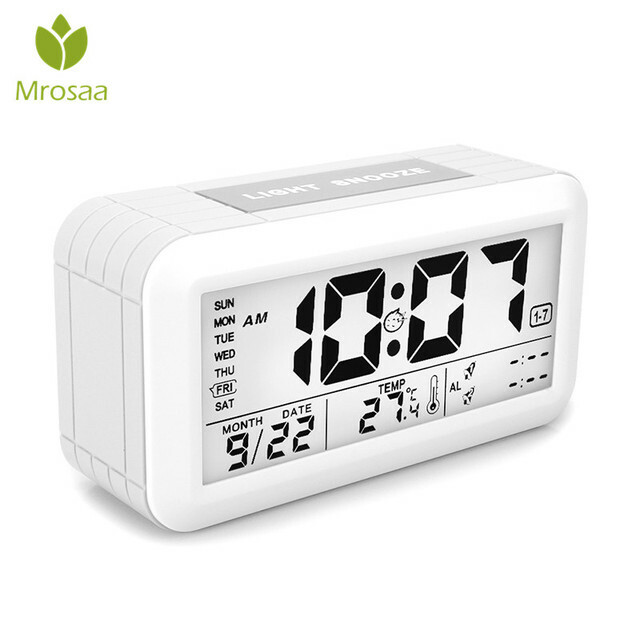 Large Screen & Clear Number Display: The large and highly legible screen display the time, day, date, temperature, and alarm time with clear and comfortable visual sense. 3 Optional Workday Modes: This clock can be optional from MON-FRI, MON-SAT, MON-SUN, which keeps you away from these tedious things such as turning on or off alarm clock every day. Dual Alarm Clock: There are two separate wake times with BiBi alarm sound softly to wake you up. 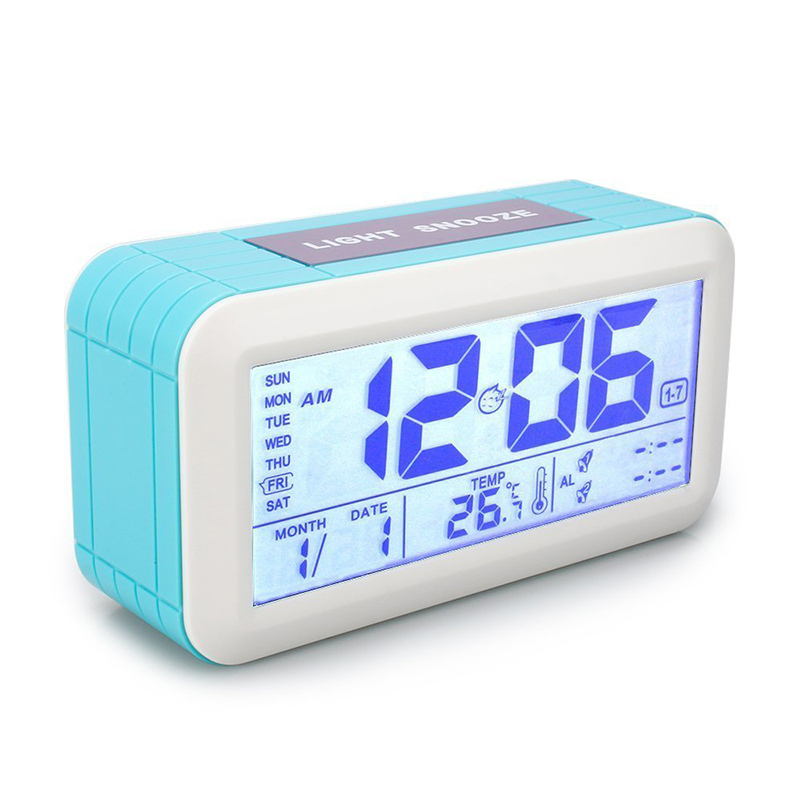 Smart Backlight Function: Screen will be luminous for 5s by pressing light button, and the backlight can be auto-adjust according to the environment’s brightness. Alarm with Snooze: Features a progressive alarm with a convenient SNOOZE button to press. 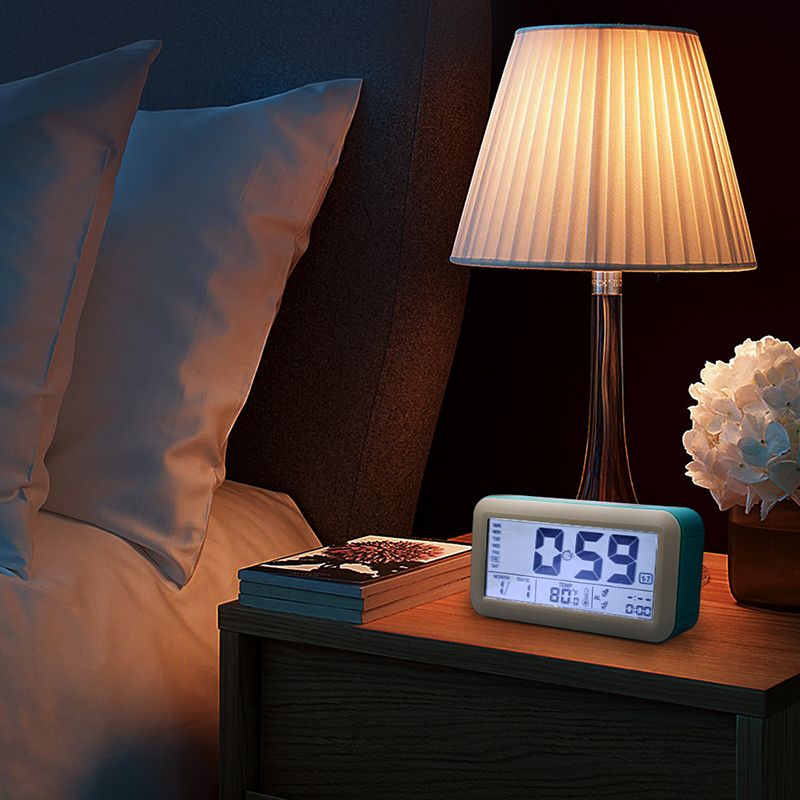 Can you get up punctually every morning? Do you have a habit to ignore the first alarm and just press the snooze button? 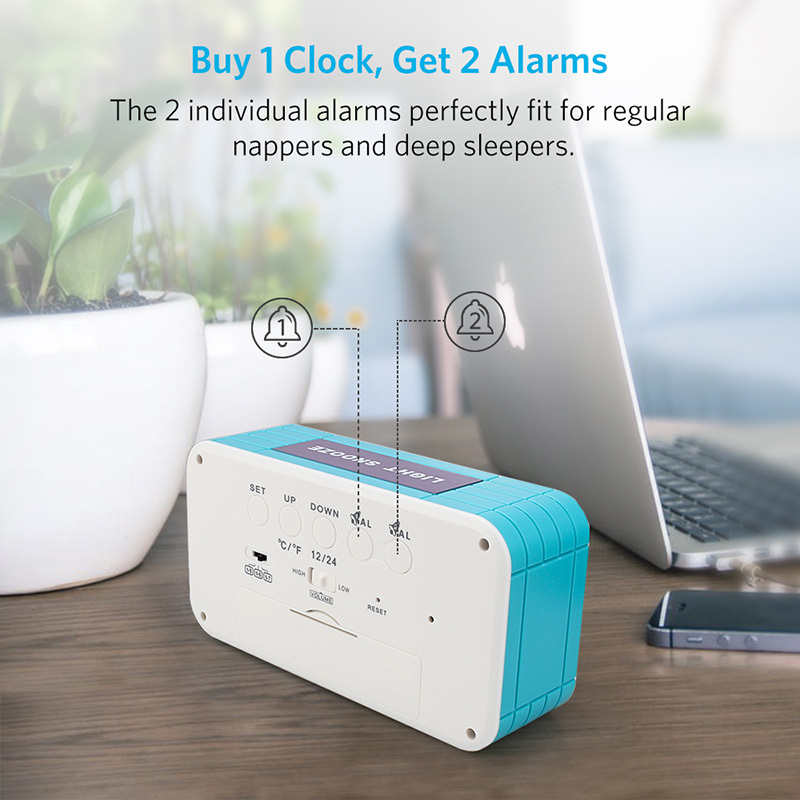 Don’t worry about it, grab our alarm clock, the dual alarm helps you to get up at a predetermined time! 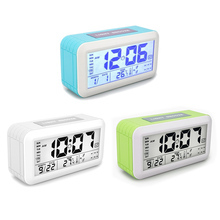 •Display time hour, minute, date, month, year, and weekday, 12/24 format changeable. 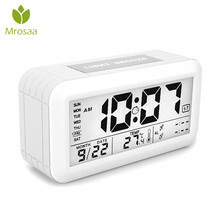 •Display temperature, format ℃/℉ changeable. 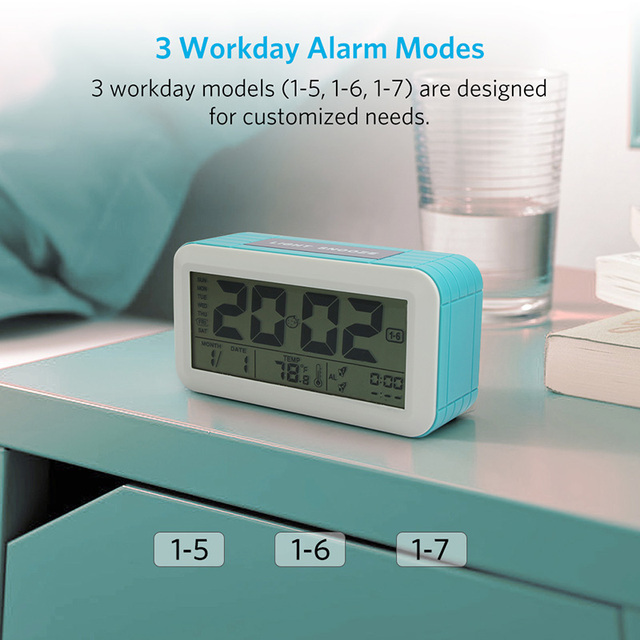 •You can set two alarm moments and select weekday 1-5, 1-6, 1-7 three modes of workday alarm on. 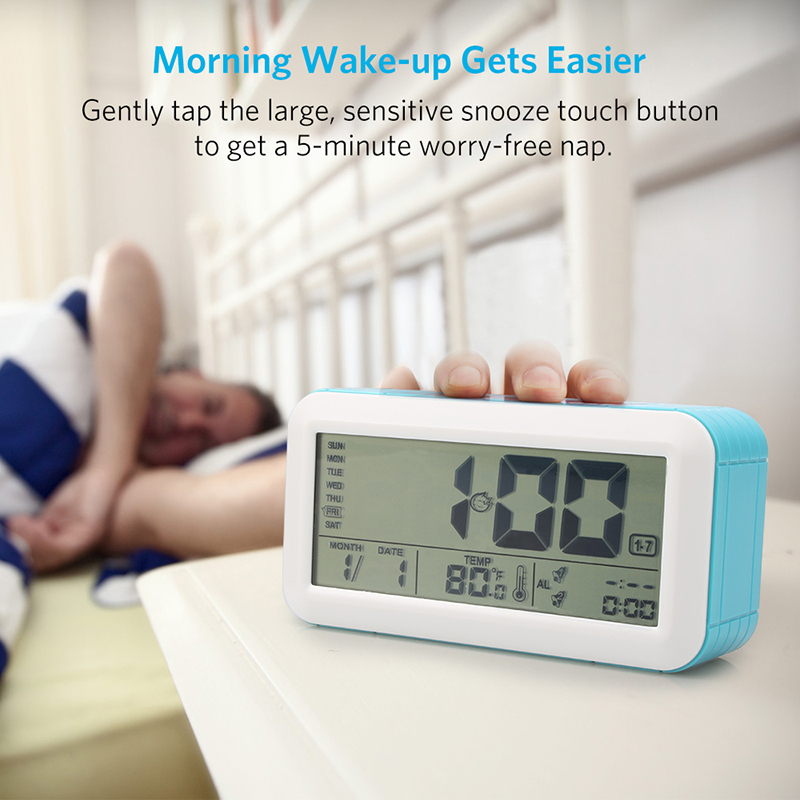 •With snooze function: when alarm is continuing, press “SNOOZE”, alarm sound stop and the clock will alarm again after 5 minutes. 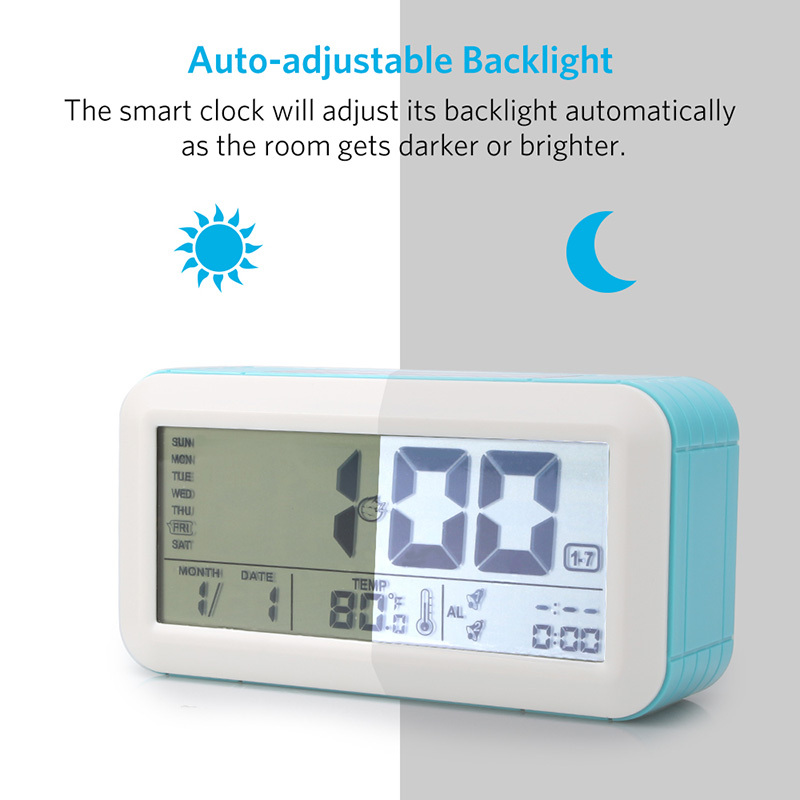 •With backlight (press light button) and smart backlight. How to set alarm time? 1.Long press the “AL1” button at the back of the clock, the screen display change “-:–” to “12:00”, the hour digit “12” flashing on the screen, short press “UP” or “down” to adjust it. 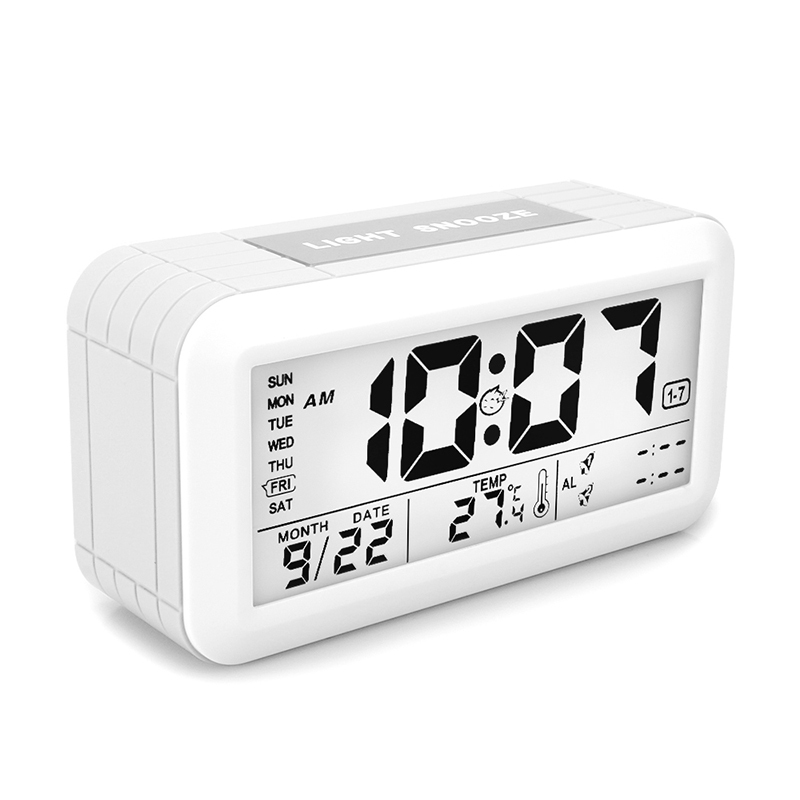 2.Short press the “AL1”, the minute digit “00” flashing on the screen, short press “UP” or “DOWN” to adjust it. 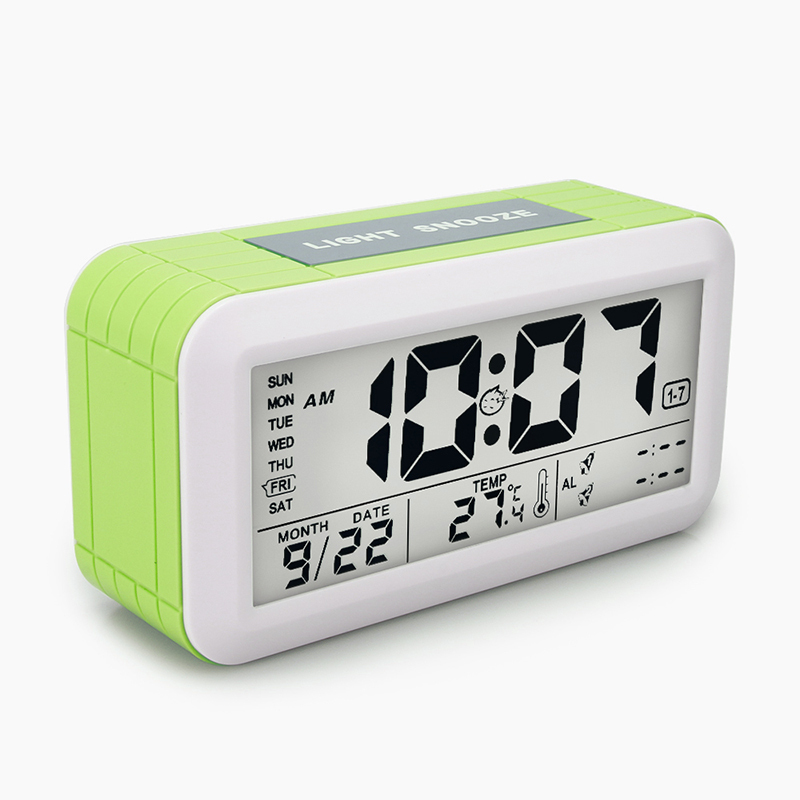 3.Short press the “AL1” to confirm the alarm time. The same way to set AL2. If you do not do anything, the clock sounds beep for 60 seconds in a crescendo. 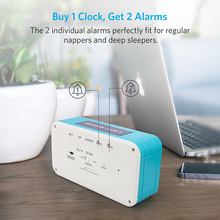 If you want to sleep for a while, touchs the “SNOOZE” button on the head of the clock, alarm sound stops, and the clock will alarm again after 5 minutes. 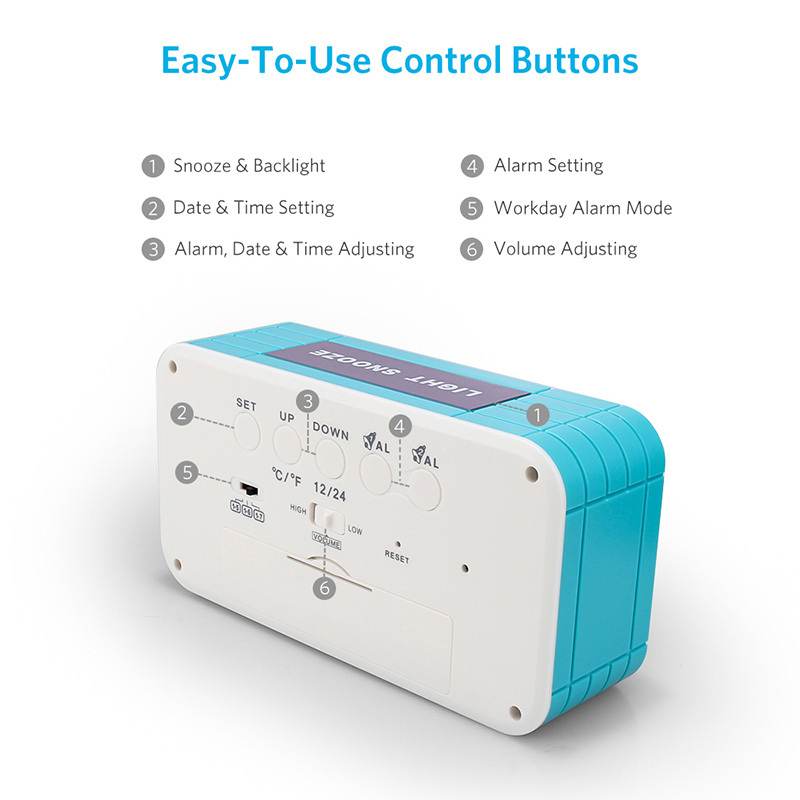 If you want to stop the sound, just short press the “AL1” button. If you do not need the alarm function, short press the “AL1”, the screen display “-:–” means alarm function off.